This ‘Bensonburg expeditionary force’ are three Trent sisters, chicken-farmers from Long Island USA. Having received a modest lump sum, they decide to take a well-earned jaunt to the French resort towns of St. Rocque and Roville. Our heroine is Terry (short for Teresa), who falls in love with Old Nick’s son Jeff. Wodehouse is in top form, expertly employing all the usual comic devices to bring our lovers together. As we expect from Wodehouse, the marriage quest involves overcoming a lack of money and parental objections, as well as painful misunderstandings, and other romantic entanglements. French Leave also deviates from the classic Wodehouse novel. It is set in France, with a French and American cast. The French flavour includes a summer festival, a corruptible Commissaire of Police, and even a risqué bedroom scene. Terry Trent is the central character, and although she is not Wodehouse’s only female lead, we are more accustomed to following the hero. It is clear that in French Leave, Wodehouse is trying something a little different – and he does it superbly. French Leave was not universally well-received back in 1956, and it seems modern readers (judging by ‘Good Reads’ reviews) are similarly inclined to prefer it when Wodehouse sticks to his established formula and characters. This seems a shame, because there is much to enjoy in Wodehouse’s stand-alone novels. One of the delights of French Leave is the Marquis de Maufringneuse et Valerie-Moberanne. Old Nick steals the show with a terrific personality, reminiscent of Ukridge. Old Nick quivered at the magic word. Americans were always rich. God bless America, he had often felt, unconsciously plagiarizing the poet Berlin. Old Nick quivered again. He knew what those suites on the first floor of the Hotel Splendide cost. Old Nick, unaccustomed to office life, finds the prospects of a fine day cooped up at work unendurable. Instead of enduring, as we workers do, he bucks. We can only dream of following his example. My own life is ebbing away inside a tiny, windowless office — designed by the sort of people who feel that a combination of concrete and asbestos makes the perfect work environment — and not a day passes when I don’t feel it. Old Nick’s defiance brings us both pleasure and a reminder of our pain. Nor is this a one-off. Wodehouse (who was once a bank employee) releases many captive workers in his stories, and there is a depth to this recurring theme that his critics (and even some fans) overlook, especially if they are readers who lead easy lives. There’s nothing wrong with an easy life, but for those less fortunate, Wodehouse gets to heart of our plight — it’s no surprise to us that George Orwell was a Wodehouse fan. What is it about eggs that has Wodehouse characters dashing off to France? Like the Trent girls, my trip to Paris was a fleeting escape that drained the family coffers, but was worth every penny. While strolling in the Latin Quarter, I spotted a man who might have been the Marquis himself, long haired in the style of Louis the Somethingth, wearing flamboyant purple trousers and a pair of preposterous gentleman’s heels. His face was furnished with a dashing moustache. I don’t wish to give the impression that all of France was got up in this sort of fancy dress, but I was delighted to encounter such a character in 21st century Paris. I do hope he was bunking off work! What Ho, Mike! I hope you enjoy it. This is a wonderful review Honoria! I’ve never read “French Leave” but now I really want to get hold of a copy! It’s great fun – I think you’ll like it. Hope you like it Cindy. It’s great fun. Must pick up and savour this one! What Ho, askokbhatia! I do hope you enjoy it. I’ve always loved ‘French Leave’. The passage where M. le marquis unexpectedly turns up at work is one of my all-time favorites. PGW at his best! Oh, I’m so glad you like it too, Louis! I think this book is a real gem. The Marquis is a terrific character. French Leave is great fun. And your review makes for good reading too. Thanks for the kind words! Welcome aboard. Earlier this year, you may recall, I proposed a mini reading challenge –to include a book by P.G. Wodehouse in your 2016 reading, under one of this year’s various Reading Challenge categories. Stefan Nilsson suggested ‘The Code of the Woosters’ in the 20th Century Classic category. I read Laughing Gas in the ‘book from the library’ category. French Leave is another suggestion, which you could include as ‘a book set in Europe’. 2. 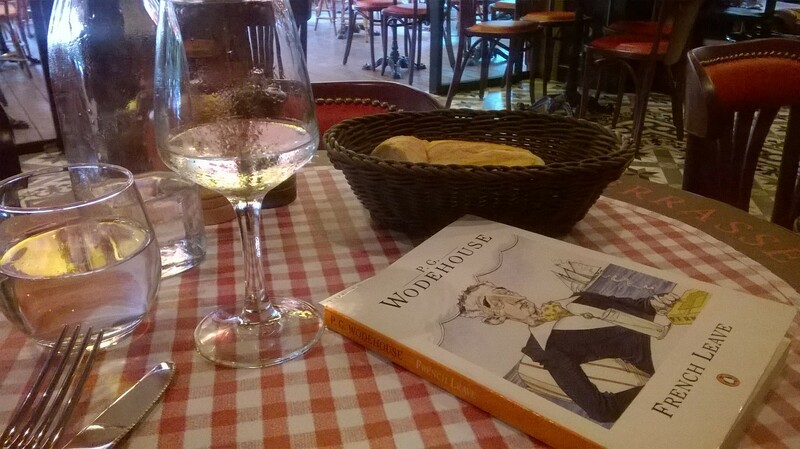 Choose a Wodehouse book to fit one of the categories, and read it (if you haven’t already). 3. Reply to the original challenge page telling us which book you selected, and the relevant reading challenge category. You don’t have to be actively participating in any other reading challenge to enter, but you do have to have read the Wodehouse book. My copy of French Leave has a note scrawled in it by a previous owner: “This guy is fiery rascal. He’s lifted one or two chapters (p.18 et) of Courteline’s ‘MMRS Les Ronds de Cuir’ — mild slang — late eighties for bureaucrats. This, the real thing — while P.G.W. a fake, a polygraph nauseous fake — R.R.L., Tahiti — 59.” And of course it’s true, As NTP Murphy explains in his Handbook, Plum lifted whole slabs almost verbatim from a 1900 French play by Georges Courteline. He also “borrowed” the plot from Guy Bolton, for which Bolton received half the proceeds of French Leave. Questions remain: how did RRL (whoever he/she is/was) get an English copy in French Tahiti in 1959? And how did this person happen to know this Courteline play? Oh, and this is a first edition, ruined, I suppose, as a collectible by the inscription but rendered priceless for me as a curiosity. Sorry for being long-winded. What Ho, Noel. As my draft reply to your excellent and thought-provoking comment has now exceed 500 words, I am going to write a new piece in response. I hope you don’t mind.